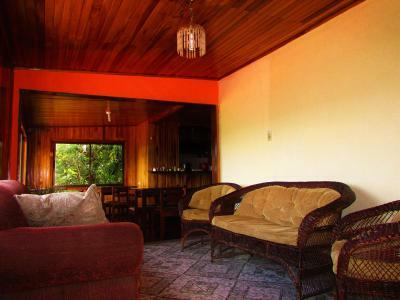 Lock in a great price for Que Tuanis Hostel Monteverde – rated 8.3 by recent guests! 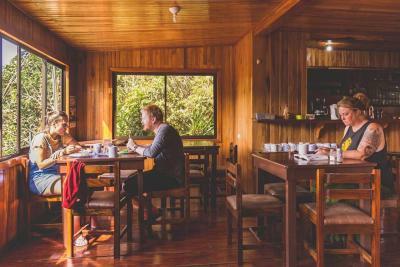 The complimentary breakfast in the morning was great, and the location for this place is very convenient for all types of travelers. I enjoyed the outdoor patio area, although very minimalist, and the natural beauty surrounding that area. 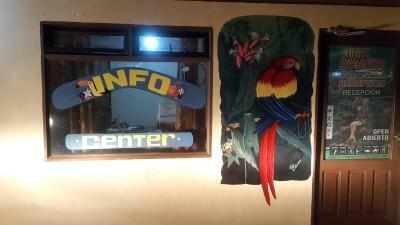 One of the BEST hostels I’ve stayed along my whole trip in South and Central America! The lady who runs the hostel is AMAZING, she took care of me like I’m her own brother, helped me to book everything at the last minutes and was so nice all the time. 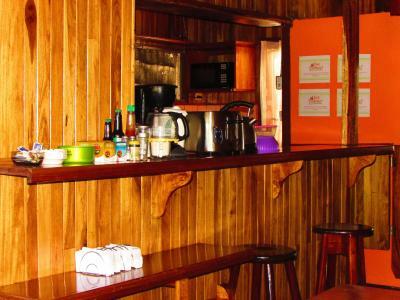 The hostel is well equipped with all what you need, and also a great kitchen to cook to yourself. 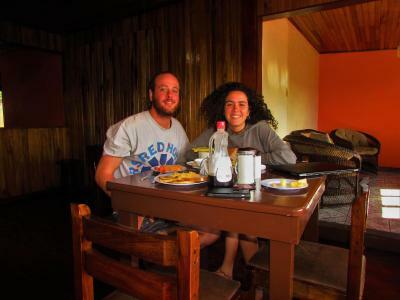 Close to everything, especially to the big Supermarket, and you can book everything through the hostel. And the lady has CUTE dogs! Really going to miss them!! I’m not usually write comments about my staying, but this hostel made me feel like home more then any other place I have stayed until now. 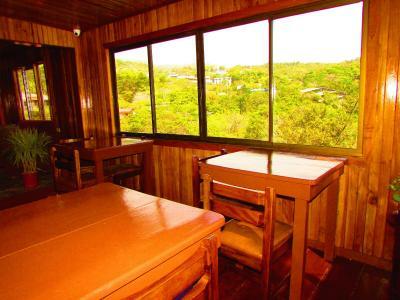 The property is in a nice location with excellent views. The views will be better once the outside de king area is complete. 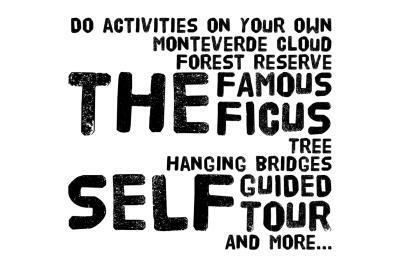 The staff are very friendly and are very familiar with all the activities in the area; I found their recommendations were spot on. 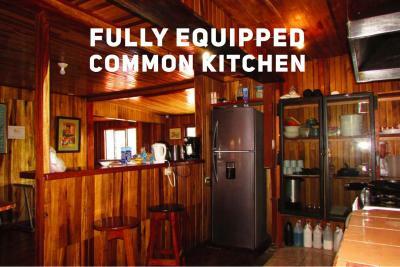 The kitchen is well equipped, and the fridge is very large. 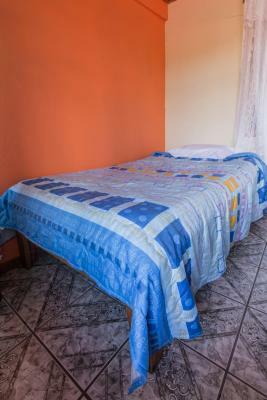 For the number of beds in the hostel, I doubt that anyone will ever be stuck for space. The rooms aren't huge, but the common area is large enough for all the guests, without it feeling crowded. I really enjoyed staying at this hostel. We got good view from our private room window. Staff was very helpful and nice. Good hot shower to relax after the full-day hiking. 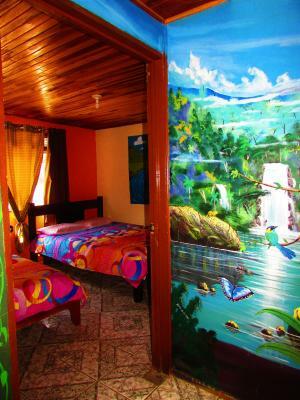 A great hostal in every aspect. The staff, particularly, David, was exceptional. 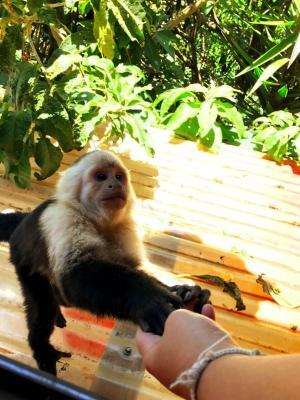 He took great care to welcome guests, ensure that their needs are being met and explaining options and arranging for the many available tours and activities. 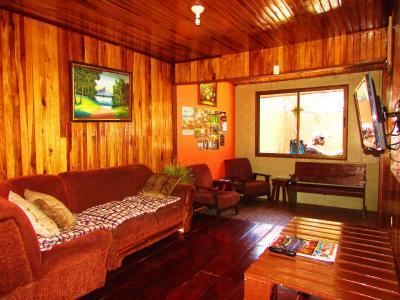 This is a hostel so you get what you pay for. 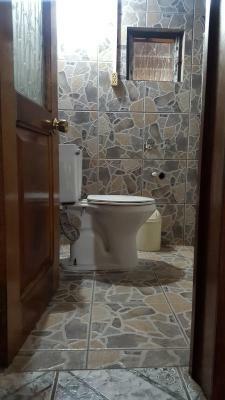 We had a private room with bathroom and it was fine for a one night stay. The bathroom was fairly clean. The breakfast however was not good at all. Staff here is really friendly and helpful! Henry helped us a lot and he was always patient. 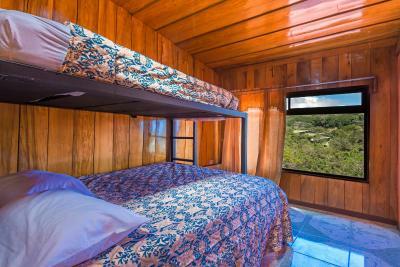 It has a balcony with beautiful view! 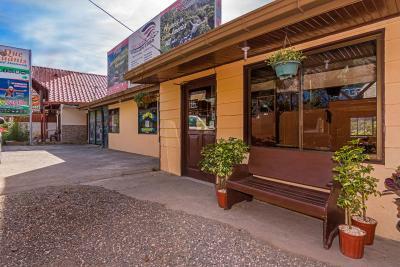 Nice location and very helpful staff. Great breakfast. Cozy room. 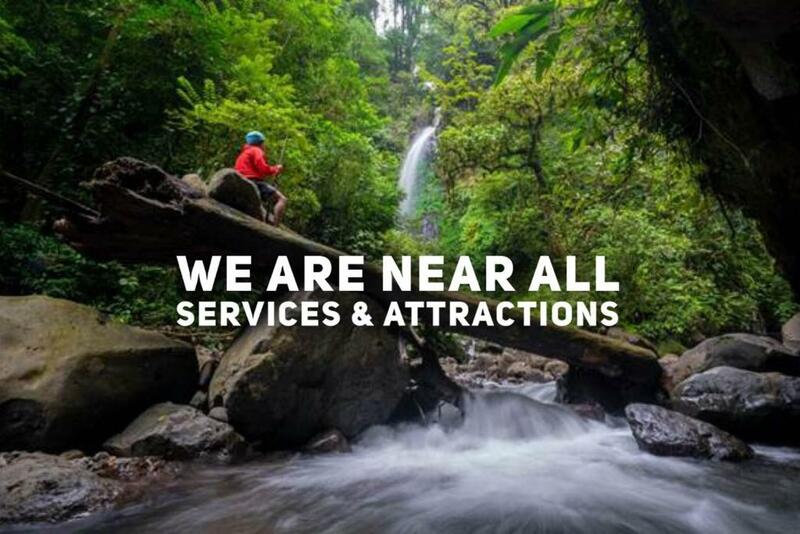 Located in Monteverde, Costa Rica. 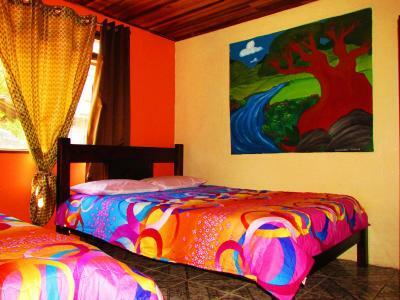 Que Tuanis Hostel Monteverde offers accommodations with a terrace and free WiFi. 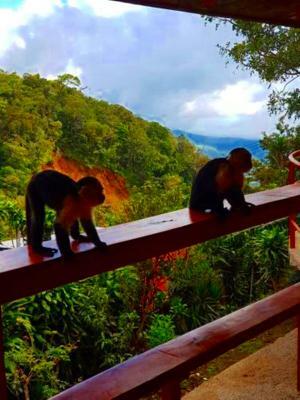 The property is located 1.9 mi from Sky Adventures Monteverde. 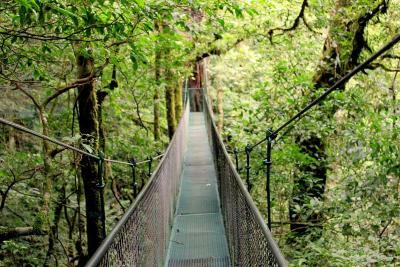 Selvatura Adventure Park is 2.6 mi away. At the guest house, includes a shared kitchen all equipped. 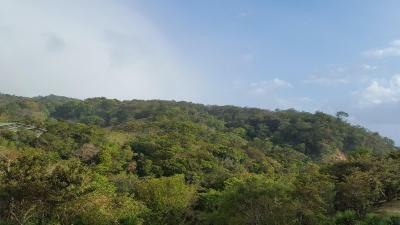 Monteverde Ecological Sanctuary is a 6-minute walk from Que Tuanis Hostel Monteverde. 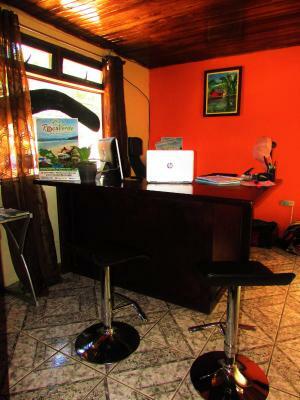 The nearest airport is Tambor Airport, 42 mi from the property. 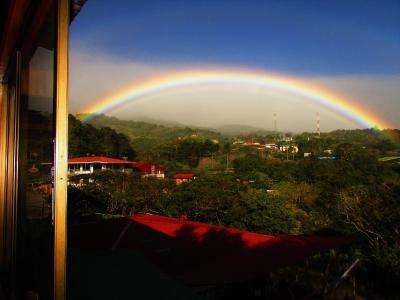 When would you like to stay at Que Tuanis Hostel Monteverde? 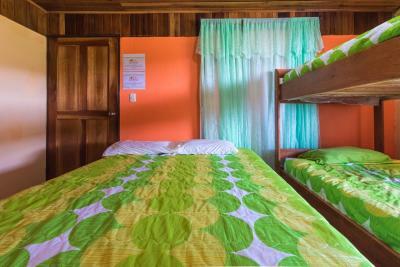 House Rules Que Tuanis Hostel Monteverde takes special requests – add in the next step! Maybe a hook in the bathroom / room would be a good idea, so we can hang up our towels and stuff. In addition, there was one switch to control the warm water, but some people in the hostel definitely had some trouble finding the right one, and with that switched off not only the lights but also the wifi.. 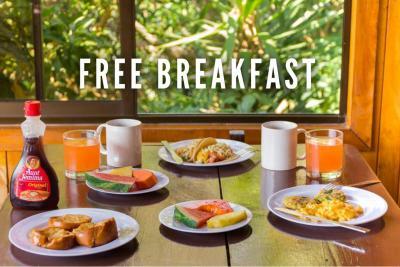 The staff was very welcoming, and breakfast was included and very nice! Fresh fruits every morning! The hostel is extremely noisy, basically it’s like being in a huge dorm you could hear people talking from other rooms and from the lobby, unfortunately after 9pm there is nobody of the staff to take care of it nor any kind of silence rules. The dorm has no windows nor ventilation system and the only bathroom with shower and also no windows is inside the dorm, you can imagine the rest. At night a woman started shouting outside the hostel and trying to get in. The door of the dorm doesn’t close. 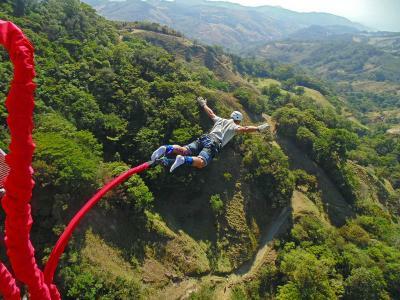 Be also careful because booking location will send you in a complete different area up and down a hill so better ask people around. Breakfast is good, the shower is hot. Staff is friendly and helpful. Overall the stay was not super bad.. 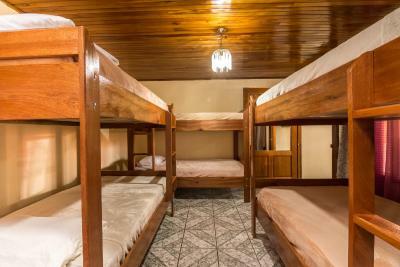 But it was not worth the money.. We god a triple room with a bunk bed 1 up 2 down in a room so small that we barely could walk with our 3 backpacks in the room. A couple next to us as several bites on her back. 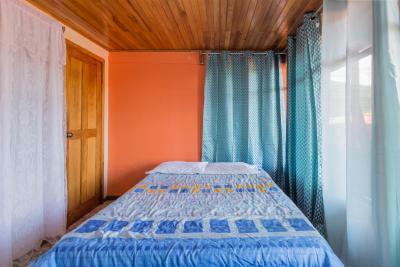 We extended our stay when we arrived and we have been told that we needed to change rooms because we had a more luxury room. My friend waited in the common area with the luggage with a migraine till she could enter the new room because our was already booked or something. Because of her migraine they could let us in the room earlier which was not true.. After 2 hours more waiting she could enter our same room!!! Why didn't they told her earlier? Also the girl didn't knew anything about the tours.. And the boy told us that we should book trips with them so we wouldn't help others then the hostel(?) Beside that.. 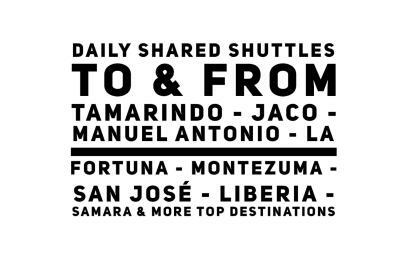 They gave us the wrong information about going to santa teresa. They were 100% sure that there would be a bus waiting from the 8.30 ferry which wasn't true. 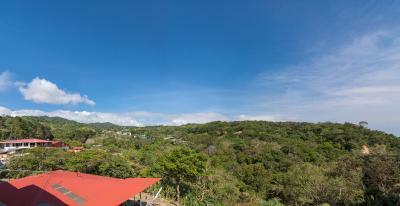 View is nice from the lower rooms. Breakfast was nice. 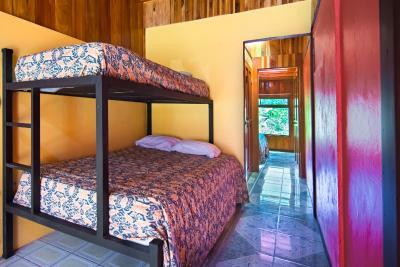 I was traveling alone, so I got a single room with shared kitchen and bath for a really good price. We were three rooms using the same kitchen, so in the evening we all gathered in the kitchen for a talk. 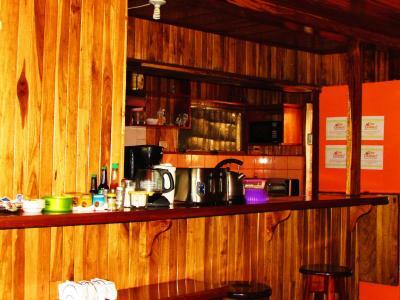 It's a small clean hostel with a familiar atmosphere close to the center. 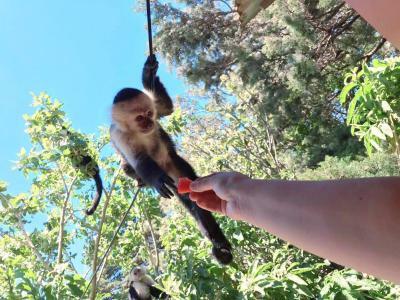 The young owner is very helpful, always good-humored and organised all my trips (A night tour is really worth it!). One tour started early in the morning so he prepared breakfast even before breakfast time for us. 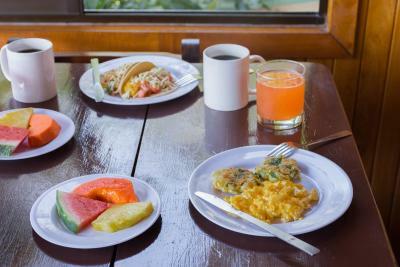 For breakfast you can choose between delicious rice & beans, pancakes or toast and you always get a plate of fresh fruit and good coffee. 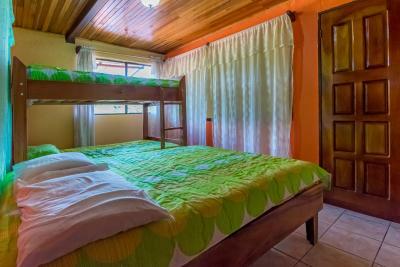 It's really kind of a good-mood-hostel, I can highly recommend! The small room is without wall insulation, so our neighbors were quite noisy getting ready a 4 am. 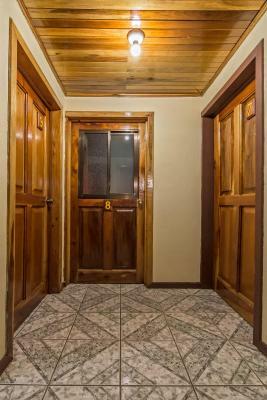 We had one of the cheap rooms down in the small extra house. There was a strong smell of wooden paint within, but it was okay when we left the door open. 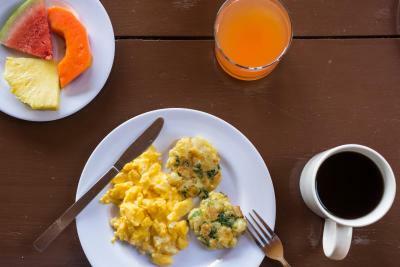 Very delicious breakfast, good advice for tours and restaurants. Super friendly staff! Verg helpful and give good advice. 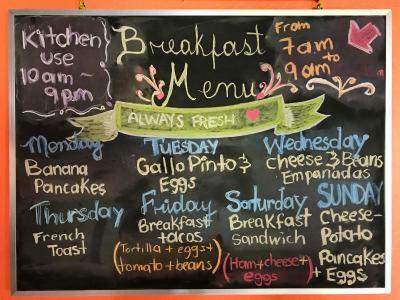 Great breakfast (you can choose gallo pinto, pancakes or toast and eggs and you always get fruit). Good value for money. 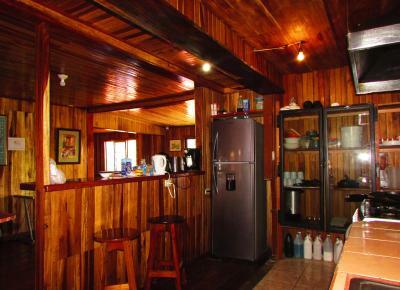 I stayed in this little cabin that chared a kitchen with 2 other rooms, it was well equiped. The host was really nice, but barely spoke English. 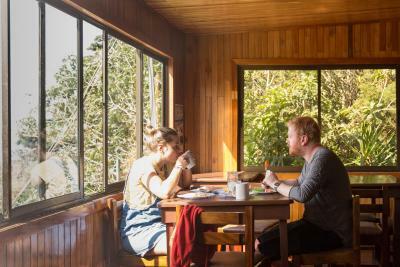 They had a nice big terrace, a decent kitchen, and the breakfast was fine as well. Good value for the money. They also had a few board games for usage, and a couple of cute cats. I would never book here again, because the amount of money that we paid for this location was not what was expected. We were told that there was a private room for me and my SO, and then we were given a locked room with two beds (we could barely fit our bags in there). They totally lied - and did this to another group of girls who came in. 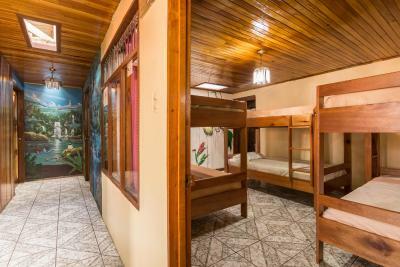 They only have 1 private room with a bathroom, the rest of the rooms have anywhere from 2-5 beds in the room and one shared bathroom. We were really displeased. The mattresses were terrible for our backs, and I couldn't get a good nights rest because I was tossing and turning. The sun came right into our room and would wake us up because there is no AC or fan to use. The two men who worked the front desk are TERRIBLE at their job. One of the guys left during our stay so there was one young man running the office. 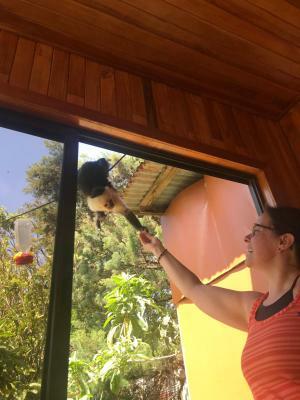 They not only run a hotel (? hostel) but they also are a booking site for a lot of the tours. DO NOT BOOK WITH THESE PEOPLE. 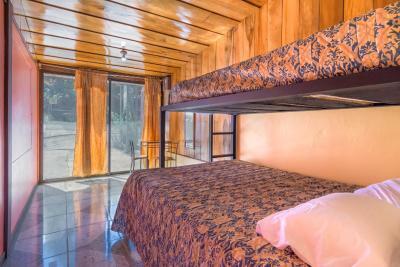 Go into Santa Elena to book directly through the Visitor Center, or the company itself (everything is walking distance). The first day we were there we wanted to book a night tour, which they claimed that they could do. They told us 30 minutes before the shuttle was supposed to pick us up that the tour was cancelled. Upon further proddin we discovered that they did not book the tour until 3 pm that day (we told them at 9 am). Another family had their tour cancelled on them as well, because the guy had no idea what he was doing. On Sunday night, the guy and his buddies proceeded to get drunk and converse loudly though the entire place. It would have been okay, but they were ignoring their guests, and even told a woman that he couldn't help her until 9 am the next morning. Noise. Not a party place but thin walls. And something crashing around outside?? Chill place, lots of info on tours and connections. Breakfast. Animals hanging around often. Slightly outdated building, could use a few upgrades. But nonetheless, clean. The management is truly outstanding. They definitely go out of their way to make sure your stay is enjoyable. Also, the facilities are very clean. Bathroom was cramped. Shower curtain had to be pried apart but other than that no complaints.